FoxFury Nomad Series quick deployment LED scene lights and spotlights deliver a portable, self-contained and cordless design that allows them to be used in remote areas. 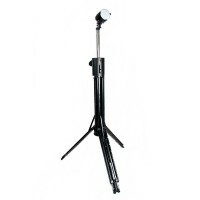 FoxFury Nomad Prime is a portable LED scene-spot light providing up to 4000 lumens. With a unique design the Nomad Prime telescopes up to 2.4m as a tripod light and can fold away into an 84cm tube for easy storage and transport. Nomad Prime is fitted with a diffuser lens to transform from spot light to area light. Powered by an internal Li-ion battery the Nomad Prime requires no generator, meaning this product is highly suitable for all emergency services and rescue operations.